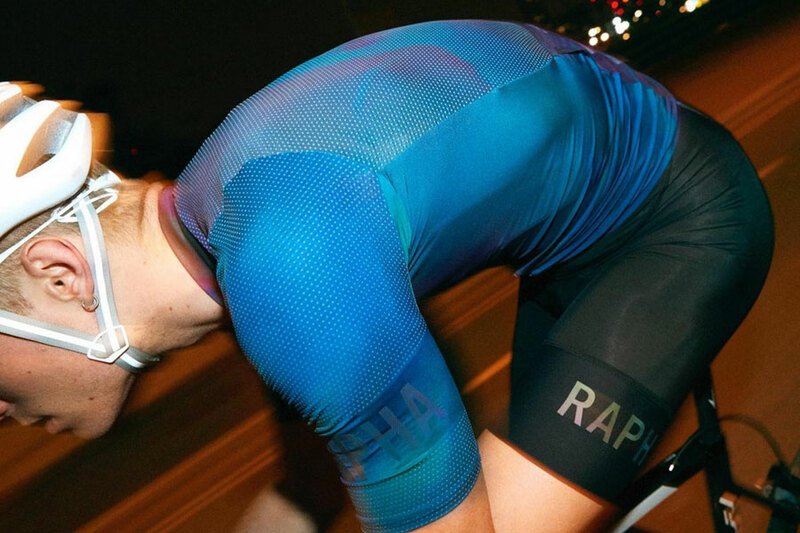 With Rapha’s new Crit Collection, those godforsakenly hot, sauna-steamy days in the saddle are that much more bearable. While the line—jerseys, a bib short, and aerosuit—is geared toward criterium racing (races done on a closed circuit), the aero-optimized Pro Team kit is perfect for intense training sessions, too. We’ve been wear-testing the Pro Team Bib Short and Pro Team Jersey in summer’s worst, and can safely say they can help you perform at your best. The Pro Team Jersey sports an oil slick design meant to mimic the frenetic, hyperactive nature of crit racing. An embossed armband, iridescent logo, and reflective hits running up your arms and down your back add some luminescence. So when you flash past the competition—or traffic—in low light, you truly shine. The polyester material is also highly sweat-wicking and light, boasting a full-length zipper and inner placket. The rear pockets are unique; the dual construction lets you slip and pin your race number between the outer mesh and jersey without tearing any holes. The pockets are sturdy enough for an iPhone 8-Plus and gummies to boot. And the gripper does its intended job of keeping the jersey from hiking up. The bib shorts have the same fabric and dual-density chamois pad as the Pro Team Bib Shorts II, but the construction is more minimalistic. There’s one seam and a slightly longer leg for a fit that’s more compressive and aerodynamic. Silicon injected into the raw-cut leg grippers provide that secure, budge-free feel. The upper is stretchy, supportive, and breathable, with the same trippy oil slick print. From an aesthetics standpoint this kit is punchy and sharp. It doesn’t matter if you’re racing or putting in the miles on a weekend ride, when your kit looks cool, you have that added confidence attacking every pedal stroke. And, not for nothing, but we’d rather stand out in a crowd in this getup, rather than a neon, print-spastic cycling kit any day. The fabric is truly great. It has that slinky, cool-to-the-touch feel that’s not quick to saturate. In fact, it’s stayed surprisingly comfortable through hill runs and 40-milers throughout June and July. The price point on these suckers is a bit of a gut-punch—the bib shorts especially. And while the jersey didn’t need any adjusting, we’ll admit the bib shorts weren’t the most comfortable we’ve ever worn. The pad just wasn’t a great fit, personally, but when it comes to bib shorts it’s all a matter of trial and error.